On your arrival at St. George's beautiful church and proceed into the narthex, you will be greeted by our ushers, who will give you the church bulletin. Proceed into the sanctuary and take any seat. 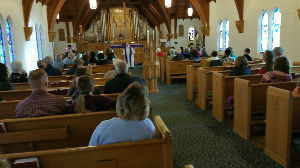 The service starts at 10:00am with a processional hymn. We then follow Rite 2 of the Book of Common Prayer, starting with a blessing, prayer, and the gloria. We then share the collect and lessons of the day, followed by a reading of the Gospel. After the Gospel reading, the rector will ask the congregation to be seated and will present the sermon. The sermon is followed by the Nicene Creed, the Prayers of the People, and the Sharing of the Peace. The rector will spend a few minutes on announcements follow the Peace. Announcements are followed by an offering and the doxology. 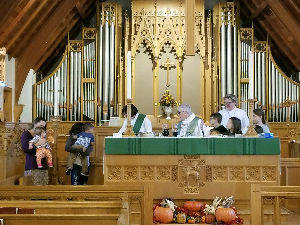 The rector will then begin the Great Thanksgiving (Holy Eucharist). All are welcome to join in the communion, which is either by intinction (dipping of the bread into the wine) or drinking from a common cup. If you would prefer to receive a blessing only, please cross your arms over your chest. 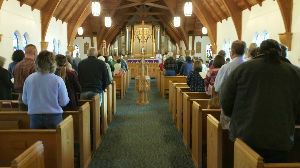 The Holy Eucharist is followed by a benediction, the recessional hymn, and the dismissal. Please join us for coffee/treats and fellowship in Rita Murphy Hall (a.k.a. the basement) following the 10:00am service. *Special occasions such as baptisms, blessings, or confirmations may be inserted at the appropriate point in some services.